“Illuminating Alice” is a deeply personal work; primarily examining the performer’s own challenges and experiences, nevertheless Alice also runs a series of workshops designed to discuss and positively promote the wider transgender experience. The workshops can explore a number of perspectives; from creating art out of personal narratives, dressmaking for Transwomen, to cross-dressing in performance. Ladies as Gentlemen! 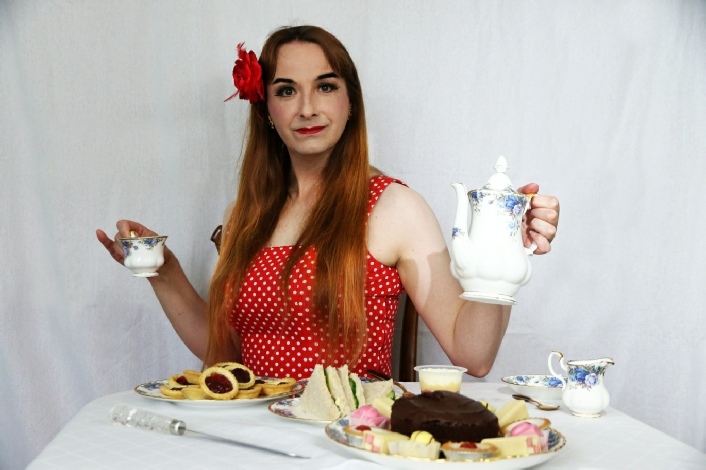 To accompany her performance of “Illuminating Alice” writer, actress and part time MtoF Retro Girl Miss Alice d’Lumiere presents a fun afternoon exploring themes of gender reversal, cross-dressing and changing personal identity. All will take place in a supportive and silly environment; a chance to meet up, dress-up, express oneself and generally be fabulous! Alice d’Lumiere invites you to touch up your lipstick, straighten your nylons and slip into your fullest fifties frock for her Turnabout Tea - and what’s more, some of the women might wish to do likewise... Welcoming transgender, cisgender and anyone with an open mind and a sense of fun... Cross-dressing,or retro attire is not required to get in, dress as you feel comfortable just bring your sense of toleration and liberation! Find your voice and start talking. The Tea Party can provide an accessible jumping off point for discussions of gender and identity; whilst enjoying music, tea and oodles of cake! Alice d’Lumiere makes all her own dresses; mind you at six foot two she has to! 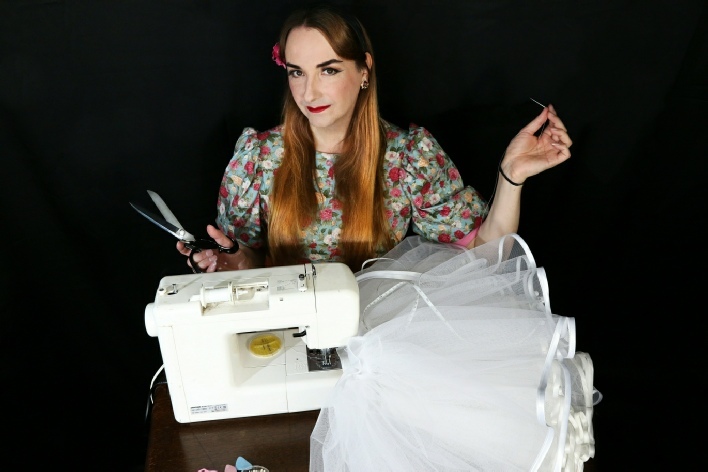 So join Alice for a lesson in dressmaking and come away with some skills to help make your own. Whether you’re TG and your chromosomes make it difficult to find a cute little retro number that fits, a genetic girl who doesn’t know her twill tape from her bias binding, or even a proficient sewer looking for some additional tailoring tricks, Alice will endeavour to help. The event’s not just about making frocks; it’s about exploring what it means to live in them. Welcoming transgender, cisgender and anyone else with an open mind and a sense of fun… Cross-dressing, or retro attire is not required to get in; dress only as you feel comfortable. Just bring your sense of toleration and liberation! Attendees can also take sewing equipment, or projects on the go should you wish to stitch and natter. “It was thought provoking, entertaining and intriguing. Also your singing was fine especially in the second song which really suited your voice.